Liverpool manager Jurgen Klopp could start Daniel Sturridge and Roberto Firmino together on Saturday in the Premier League. Sturridge was drafted in to start against Paris Saint-Germain for the Reds on Tuesday after Firmino sustained an eye injury last weekend against Tottenham. The Englishman opened the scoring with a bullet header on the half-hour mark and impressed with his general contribution as the focal point in attack, but his Brazilian teammate still managed to have the final say at Anfield. 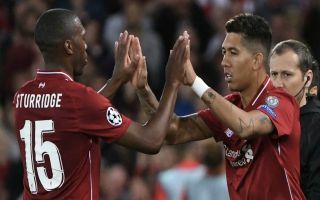 Firmino came off the bench to steer home the winning goal in a 3-2 victory with a couple of minutes remaining in added time, much to the delight of the home fans who celebrated in full-force as the Reds secured their first win of the new Champions League campaign. Klopp usually favours a front three of Firmino, Mohamed Salah and Sadio Mane when everybody is fit, however, according to Sky Sports, the German boss has stated that he would be willing to experiment with a new partnership in attack. The 51-year-old coach suggested when asked about the Brazil international’s fitness that he and Sturridge could be used from the start against Southampton, as he told reporters: “So far there is no reason to think about Bobby, it’s about thinking about how can we line up in general differently. “Could they [Firmino and Sturridge] play together? Yes of course. “It’s just positive the impact Daniel had [against PSG]. It was an intense game, it was a fantastic game by him, to be honest, so that’s the best news and so now we know more about that. The Reds have begun the new domestic season with five wins out of five and will be hot favourites to secure another three points on Saturday at home against Mark Hughes’ side. Liverpool are quickly emerging as contenders for trophies across the board this season and with Sturridge now throwing his hat back into the mix for a place in the starting line-up, Klopp has even more options at his disposal going forward.